Adirondack Scuba offers training for Recreational and Technical Scuba Divers from beginner through to instructor. The entire Adirondack Staff hold certifications through Scuba Diving International and Technical Diving International. The Open Water Scuba Course consists of online course work, pool sessions and a weekend of open water dives in Lake George. The online format allows the students to complete the class work at their own pace and on their own time. The confined water pool training is taught in a heated indoor pool. Each student will be outfitted in scuba gear and will learn basic scuba skills and safety drills. At the completion of the pool sessions the students will spend 2 full days diving in Lake George where learned skills are practiced and further reviewed under close supervision. Upon successful completion of the course, the students will receive a Scuba Diving International (SDI) Open Water Certification card allowing them to dive anywhere in the world. This price includes everything you need except for personal gear. All students in the Open Water Class need to provide their own mask, snorkel, fins, boots and a log book. Students may purchase these at discount through Adirondack Scuba. All rental scuba gear including air fills and weights are included for the entire open water course. Classes for 2019 are forming now! 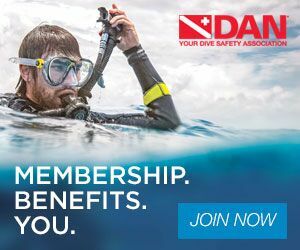 We recommend DAN Insurance for all of our divers. Click the logo below to sign up!